Even though the duration of his papal reign has since been eclipsed by that of Pope John Paul II, at the time of his death in 1878 Pope Pius IX had served as pope longer than any pope besides Saint Peter. His papacy, from 1846 until 1878, was the political and religious pivot-point of the nineteenth century. He was elected pope as the candidate of the politically “liberal” party in the College of Cardinals. By liberal here we mean those who were sympathetic generally towards the new republican and anti-monarchical leanings of so many leaders and thinkers in those post-enlightenment years; but the violent revolutions of 1848 convinced him that the liberals had far more than merely political ends in mind. In fact, he now believed that the destruction of the Church was their ultimate goal, and for many of the leaders, it was. Because of that, he became, although not by his choice, a political as well as a religious warrior. Because the position that Pio Nono inherited as Pope was that not only of the universal shepherd of the faithful and vicar of Christ, but also that of a temporal Prince and sovereign, the task of leadership before him was inextricably intertwined with political and revolutionary affairs. The great battles of church and state that dominated that century were, by the grace of God, his to fight. Mr. Hales beautifully and faithfully tells us the story of that battle and Blessed Pio Nono’s part in it. Why, since his death in 1878, has no study appeared in England of Pio Nono? Perhaps because he was a Pope. Yet this seems an insufficient answer since he was also a leading character—at first the leading character—in that drama so dear to Englishmen, the Italian Risorgimento. And even as Pope he forced himself upon the attention of Englishmen in his day by his “papal aggression” in restoring the Catholic hierarchy to England, by issuing the Syllabus of Errors, by defining papal infallibility, by enraging both Gladstone and Exeter Hall, by reigning longer than any Pope had ever reigned, by recruiting an international army, and by losing the most ancient sovereignty of Europe, the Papal States. In an important sense Pio Nono was the central figure of the mid-nineteenth century. We name epochs after their political arbiters. We talk of Metternich’s Europe, and Bismarck’s Europe, so that the period between the flight of Metternich in 1848 and the foundation of the German Empire in 1870 becomes Napoleon III’s Europe, or Palmerston’s if, with Shakespeare, we were to choose for our title the suffering tragic hero, the symbolic central character, then the middle of the century would be called the age of Pio Nono—for the same reasons as Shakespeare called his plays King Lear or Othello, rather than Goneril or Iago. Those who were working for change, or for power, assailed the Pope’s claims, and brushed him aside; but they could not prevent the eyes of a world-wide audience being fastened upon the stage of his misfortunes. Nor could they stop him from rekindling, in his old age, flames of fervor that have burnt ever since around the world. The recent appearance in Europe of two major publications concerned with Pio Nono is a reminder of our own neglect. One is R. Aubert’s Pontificat de Pie Neuf, which is a history of the Catholic Church in this pontificate. The other is the correspondence of Pio Nono with Victor Emmanuel and Napoleon III, and of Cardinal Antonelli with the papal nuncios, between the years 1847 and 1863. P. Pirri, who has edited this correspondence, has performed a very important service—the more so since the papers at the Vatican belonging to the period of Pius IX remain inaccessible to the historian. The writing of an adequate biography of Pio Nono must clearly await the opening of the Vatican archives; this study makes little attempt to portray the life of the Pope. What it attempts is to look at the major issues of the time as Pius looked at them, to see, from his standpoint, the aspirations of Garibaldi, Mazzini, and Cavour; of Victor Emmanuel and Napoleon; of the liberal-Catholics and the Ultramontanes. Thus far, in England, the Italian Risorgimento has been considered almost exclusively from the standpoint of its leaders. It has been assumed that, though they quarreled with each other and differed widely in their aspirations for Italy, yet they all contributed to a result that was glorious. Their opponents were blind or ignoble or villainous, men whose only object was to keep Italians “enslaved.” Equally black and equally white have appeared the protagonists in the wider struggle between Rome and the progressive liberalism of the time throughout Europe. On the one side were the “obscurantists” and “fanatics”—the intransigent Ultramontanes. On the other were the liberals, fighting for freedom and truth, whether as professors, as protestants, or as liberal Catholics. Here and there a heretical scholar has appeared, even in England, who has doubted this liberal orthodoxy. G.F.H. and Mrs. Berkeley, in their fundamental volumes on The Making of Italy, have thrown the early part of the story—before 1848—into a new light, and have written much that is valuable about the first two years of Pio Nono’s reign. And Dom Cuthbert Butler, in his book on the Vatican Council, has shown that that unique assembly was something quite other than a vast conspiracy to “subvert the conscience and enslave the mind”. But the orthodox liberal tradition, especially in the period between 1849 and 1870 (the period of Mazzini’s Republic at Rome, of Cavour’s closure of the convents, of the overrunning of the Papal States, of the Syllabus of Errors, of Montalembert, Acton, and Döllinger), still holds English attention almost undistracted by any glimmer of light thrown upon the matter from the opposite viewpoint. It is still slightly shocking to suggest that aught but obstinacy and ill-will towards his fellow human beings dictated the Pope’s retention of his sovereignty at Rome and Bologna, his issue of the Syllabus of Errors, his support for Ultramontanism. conceived of a much closer interdependence of politics and religion. To him his sovereignty over the Papal States was an aspect of his spiritual sovereignty, and he was profoundly concerned with the policies of governments all over the world, not merely with their attitude towards clerical appointments or church property but with their legislation concerning education or compulsory military service or matrimony. His enemies took a like view. Mazzini saw the political problem as primarily religious; political dreams were only the reflections of his religion. Napoleon III or Cavour or Bismarck might talk about separating Church and state but what they meant was subordinating Church to State. They knew well enough that the two were interdependent, and they meant to put the State in control. The theories that flitted fitfully through Napoleon’s imaginative mind, the utilitarian aspirations of Cavour, the Erastian ambitions of Bismarck had as their starting-point a “settlement” with the Church, and by this they meant control over clerical appointments and clerical pronouncements, or closure of convents, or launching of Kulturkampf. Shall we call their aspirations political or religious? No doubt we shall call them political, and rightly so, as we shall rightly call the Pope’s religious; but they could not advance their purposes without fighting in the field of religion, and the Pope could not defend the Church without fighting on the front of politics. That is why the study of Pio Nono’s eventful reign has to be undertakenas a study in politics and religion. Every move made by the Pope or by his enemies demonstrates this. The defeat of Mazzini’s Roman Republic in 1849 was a check to the political aspirations of Mazzini and Garibaldi, but it was also a (temporary) victory for the papacy over Mazzini’s religion of the people. Cavour’s victory in closing the Piedmontese monasteries was the prelude to his assuming political sovereignty over the Papal States. Napoleon’s planned withdrawal from defending Rome in 1864 provided the occasion for the issue of that notorious religious-political document, the Syllabus of Errors. The errors of that Syllabus were largely Cavour’s, Mazzini’s, and Napoleon’s. The Vatican Council was in constant danger of political intervention from abroad. It was Bismarck’s political success that led him to invade the religious field with his Kulturkampf. To understand the Roman viewpoint in these struggles it is no doubt advantageous to be in communion with the See of Rome, but it is not necessary. The man who best understood Pio Nono’s purposes, in his later years, was the protestant Premier of France, Émile Ollivier. And the most effective critic of papal policy, in the same period, was the Catholic Lord Acton, to whom communion with Rome always remained “dearer than life itself.” Nor, to appreciate Pio Nono’s policies, is it necessary to be conservative in outlook. He started as a political liberal and became a political conservative; but he fought, always and everywhere, for the Church, and for freedom for the Catholic life, and that meant utilizing whatever political assistance lay to hand, in fact, it meant political opportunism. His real and permanent achievement was to give victory to the Ultramontanes, but Ultramontanism by its very cosmopolitan nature was often compelled to be anti-conservative and even politically rebellious since it was necessarily hostile to the Gallican claims of legitimist princes. In the ‘thirties and ‘forties and even in the ‘fifties, Ultramontanism was very generally in alliance with political liberalism. By the ‘sixties it was generally anti-liberal, and so was Pio Nono, but even in that decade the most persuasive of all the Ultramontanes was Montalembert, and he remained passionately liberal till his death in 1870. 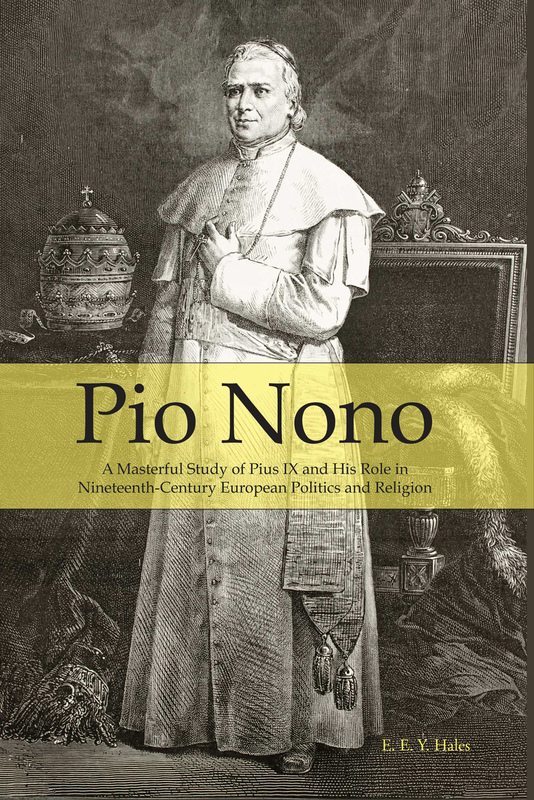 Pio Nono never ceased to protest his own indifference as to “forms of government.” States might be absolute monarchies or popular republics so long as they allowed the Church her rights and liberties—a papal view which the Neapolitan Bourbons found distressing. The victory of the mob at Rome in October 1848 and the peculiar character of the Papal States turned Pio Nono into an absolutist prince. But he had toyed—rather rashly—with Liberalism and, to the end, he retained an open mind as to the extent to which, given peaceful conditions, the enlightened propertied classes might properly be given some share in his government. It was an open question in the later eighteen-fifties whether he would broaden the basis of his government; that he did not do so was due partly to the irksome (and far from disinterested) pressure brought to bear upon him from Piedmont and from France, and partly to the absence of a class of man in the Papal States to whom political power could possibly be safely entrusted. But all this is of small consequence. It is not as a petty Italian prince that Pio Nono will stand to be judged by history. He will have to be considered in his role as the most important opponent of the extravagant claims, political and ideological, of the nineteenth-century progressives, as the most obstinate and influential of those who denied the infallibility of progress, the moral authority of majorities, and the omnipotence of the State. By refusing, in the name of eternal truths, to accept the passionate enthusiasms of the men of progress he earned for the papacy much hatred in his own day. But he restored to it an authority within the Church and an influence without such as it had not enjoyed since the time of the Council of Trent. He was, in short, the creator of the modern papacy. For their generous help I would like to express my thanks to those distinguished scholars in the history of the Risorgimento, Mr. and Mrs. G. F. H. Berkeley; to Professor A. M. Ghisalberti, Director of the Instituto per la storia del Risorgimento Italiano, at Rome; and to Mr. D. Mack Smith, Tutor of Peterhouse, Cambridge, whose important study of Cavour’s diplomacy in the critical year 1860, shortly to be published by the Cambridge University Press, I have been privileged to see in proof. My book must not, of course, be taken as reflecting the views of these historians, nor those of the English historian of the Catholic Church, Fr. Philip Hughes, whose wide knowledge has enlightened me on various problems. For much help with the text I am indebted to Lady Helen Asquith.